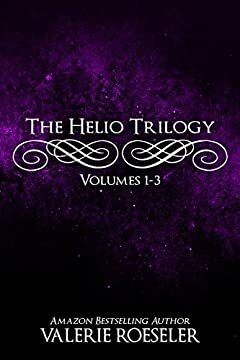 The Amazon Bestselling Helio Trilogy is now available in a single volume. MIDNIGHT DIVINE: Leaving her broken home and shady past behind, Ivy Harris is determined to make something of herself. Her new acquaintance, Jack Roe, is irritating and arrogant with a womanizing reputation. Despite his secretive behavior and constant pursuit of her, Ivy finds herself falling for him. When Jackâ€™s secrets are revealed, Ivy discovers her life isn't her own as she's trapped within a conflict between beings of light and darkness. GILDED INFERNO: Ivy Harris has been hunted down ever since unearthing her true nature as an immortal weapon created through Divine intervention. She has fought and bled, and loved and lost. Now, withdrawn from the family she gained, the love of her life, Jack, attempts to break through her walls. While sheâ€™s lost in the guilt of her past and her first love, Solas, remains in the depths of their enemies, Ivy struggles to find a balance between who she is and who she is expected to be. VERMILION HORIZON: True beauty and strength come from scars of Darkness. Ivy has been pushed to her limits and the time has come to fulfill her destiny. Her heart remains broken in two, uncertainty lingering between which path to take. Questions arise as vengeance prowls in the shadows. Suspicion grows against Ivyâ€™s mentors while her visions threaten to destroy everything she knows. When Ivyâ€™s flaws and faults become crimes against her, she is forced to relinquish an important part of her being. Yet at her weakest, she finds strength. Ivyâ€™s trials and tribulations have led to this moment. The face of iniquity may break her to the core, or it may create hope and new beginnings. Deliverance is crucial. Failure is not an option.